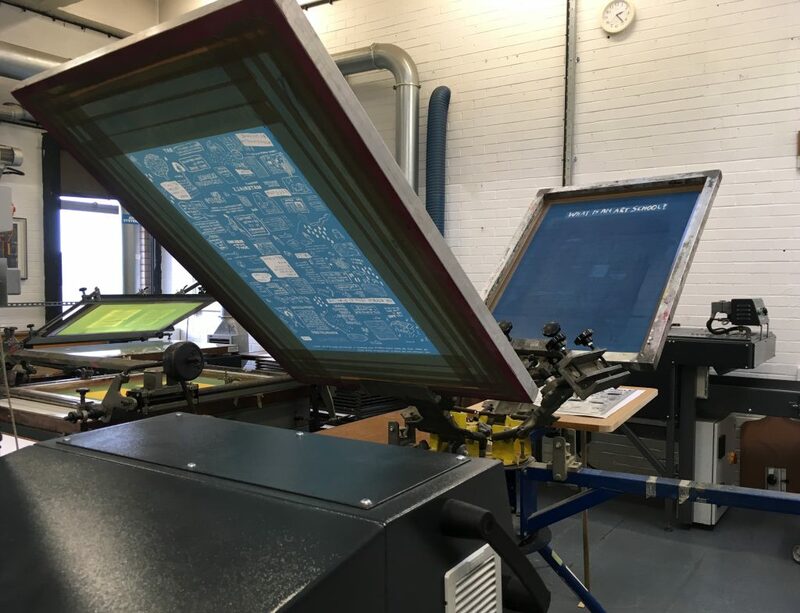 At Wolverhampton School of Art there is a huge range of both traditional and digital printing facilities. I was interested in developing my printing skills, particularly on fabric. I also wanted to interrogate how traditional printing methods can translate a hand drawn image in different ways. 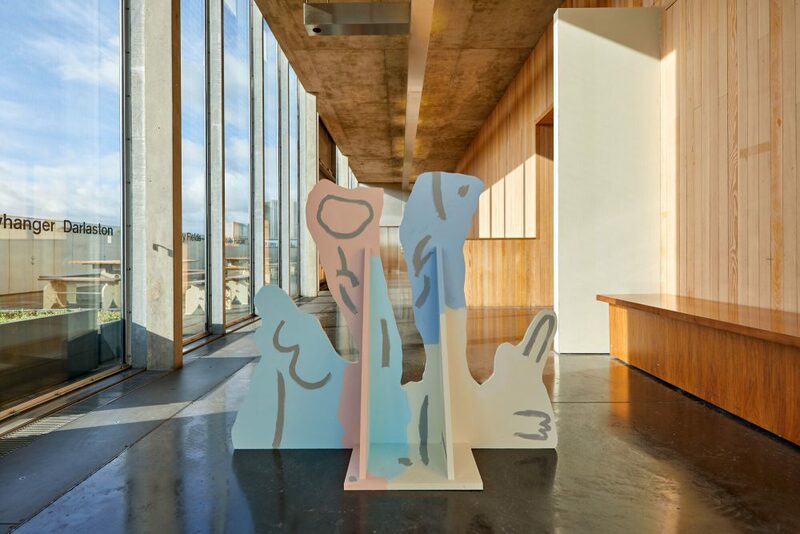 I met early on with Maggie Ayliffe (Head of Visual Arts, Course Leader Painting and Printmaking, and Sculpture and Environmental Art) and Dr Simon Harris (Senior Lecturer in Fine Art) to talk about how the residency could work. They helped work out what print method would work best – I was exploring how to find a traditional, hand produced method that would allow a quick turnaround of a large print run, but still retain the qualities of the original ink drawing. I decided to work with screen printing. Art schools and art education are constantly under pressure to justify their existence and as an artist and occasional lecturer I was interested in what it meant to be an artist in residence within an art school, and what conversations this position might allow me to enter into. I was interested in ways of conveying collective voices through un-‘institutional’ methods (and by chance the first lecture I visited was on Institutional Critique). When I was at primary school we made those tea towels where everyone draws their face on a small circle of paper, and the tiny sketches are made into a tea towel as a memento for each year. 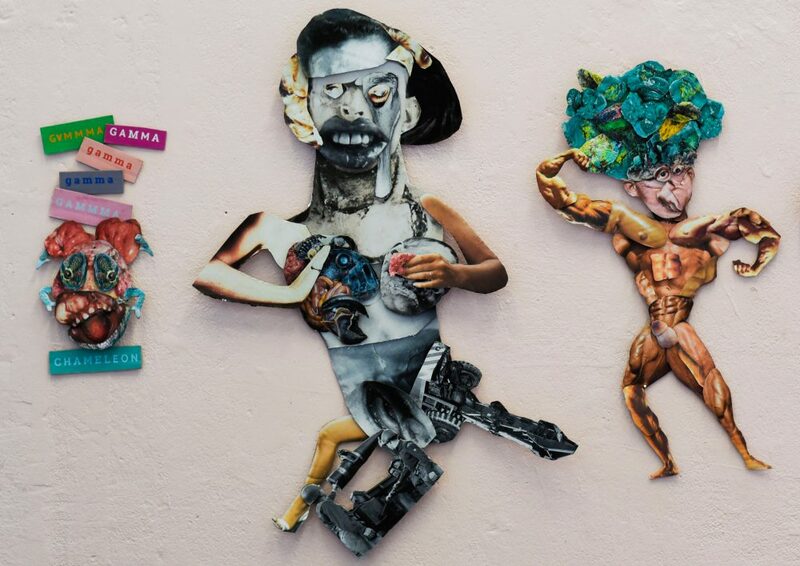 I decided to use the framework of a mass print run of a participatory artwork as a starting point for the residency. 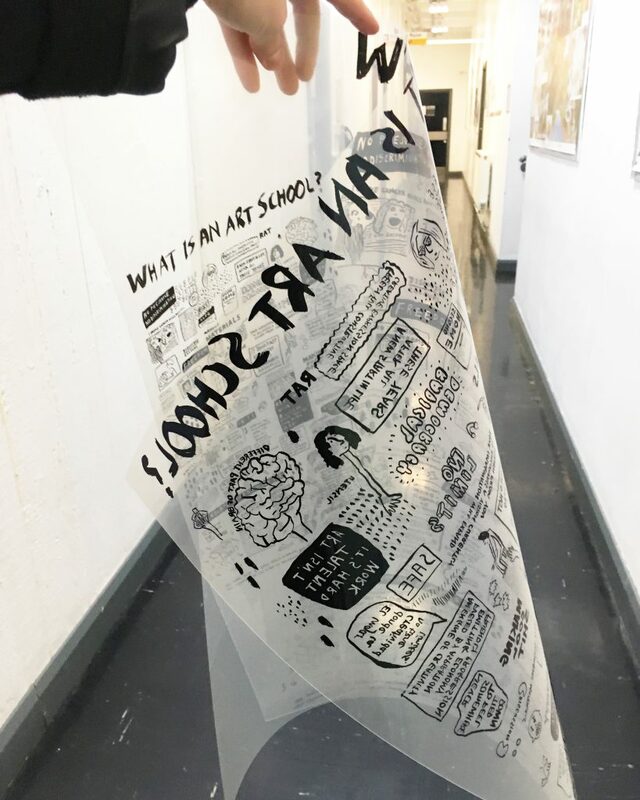 I set up an online form that was circulated to staff, students and alumni, where they could submit 200 characters of text below the question ‘What is an art school?’. This is a question that came up in conversation with Maggie and Simon during our early plans for the residency. During the residency I had a studio in amongst the students, and I visited various lectures and tutorials. Within two weeks I had 80 responses. The responses that came into my inbox varied from the political to the personal: for example, ‘RADICAL DEMOCRACY’, ’the best version of yourself’ and ‘no discrimination’. These submissions were the starting point for a large ink drawing incorporating the text and imagery described in the responses. In order to prepare this for print, I scanned the drawing and transferred it to a clear acetate film. Then I took the acetate to the traditional printing department to begin the screen printing process with Andy Roberts (Print Technican), who helped design a set up and production schedule for the two week residency. Andy built two custom sized screens at the size of the tea towels (one for each colour), then exposed them. These were fitted to a rotating printing station. One screen was used to print the red part, and the other for the black part, using specialist fabric ink. A group of students with an interest in screen printing volunteered to help with the print run during career development week. We printed 200 tea towels during the residency. 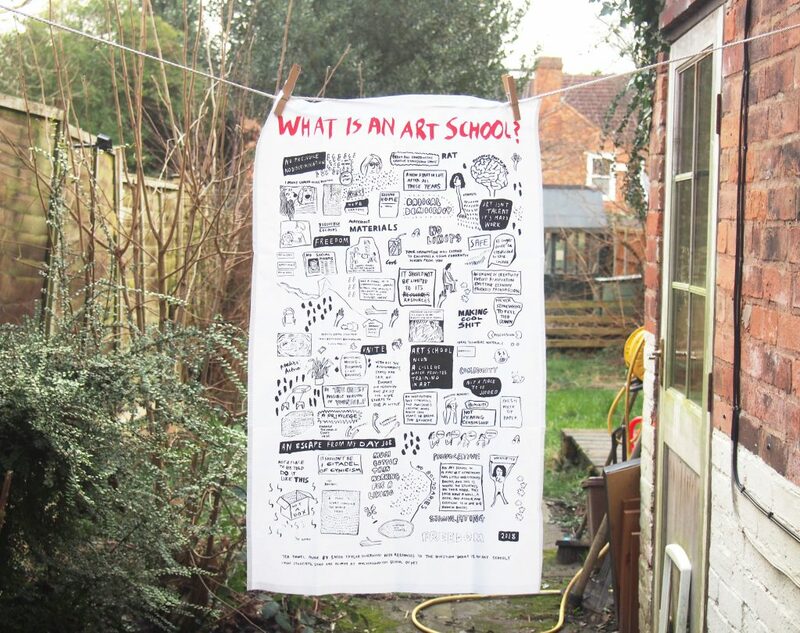 Like the original school portrait tea towels, they act as an archive of a particular time and place. The design and production of this printed work were collaborative. 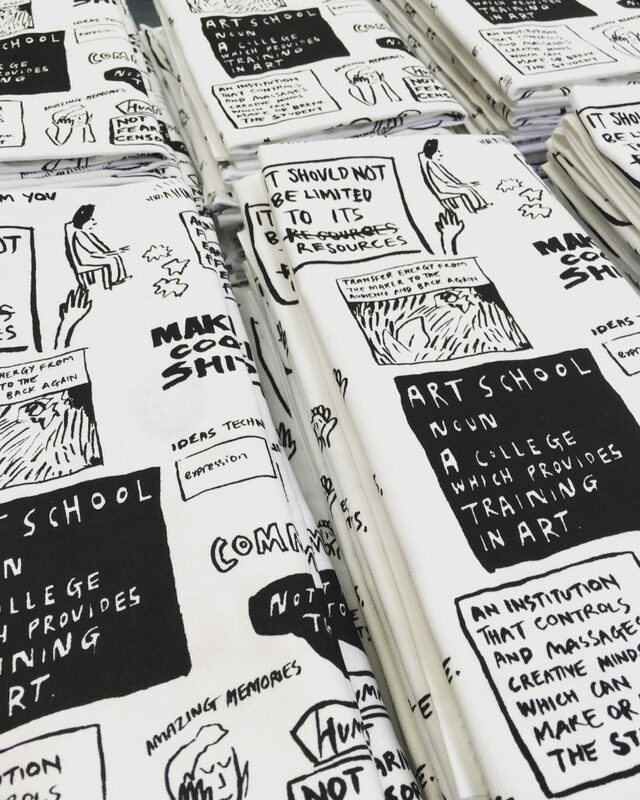 Everyone who left a submission on the online form was given a free tea towel, along with staff and students who were involved in the production. Freelance curator and writer Angela Kingston reflects on Sarah Taylor Silverwood’s solo exhibition Daphne, on display at The New Art Gallery Walsall until 12 May. Engine and GRAIN are delighted to announce that Lily Wales has been awarded our £1000 bursary. The bursary was for an artist living and working in the West Midlands region who uses photography as an integral element of their practice. 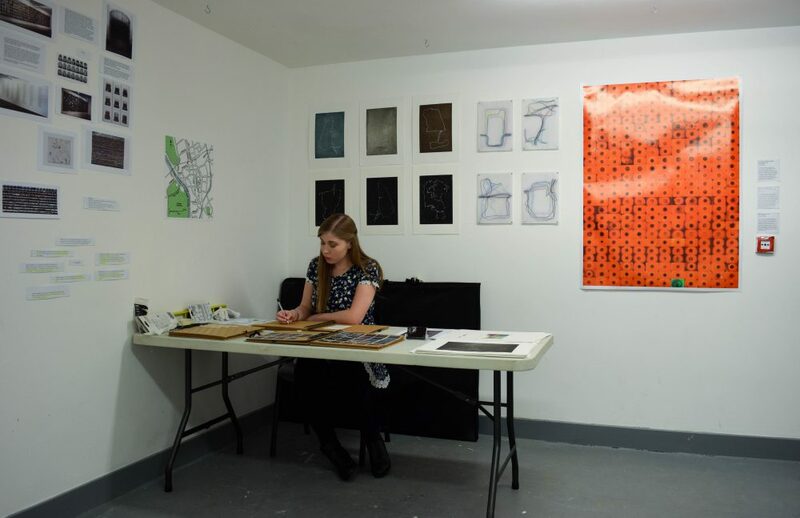 Artist Suzie Hunt recently undertook a two-week Engine Micro Residency based at the Garage Studios at the University of Worcester. Here she reflects on her experiences.  New Art West Midlands is funded by Arts Council England and we are hosted by our lead partner Birmingham City University.  We are supported by our project partners Coventry University, University of Wolverhampton and University of Worcester. New Art West Midlands Exhibition 2017 is led by Birmingham Museums Trust with support from participating host venues. It is funded by Arts Council England alongside Birmingham City University, Coventry University, Hereford College of Arts, Staffordshire University, University of Wolverhampton and University of Worcester. New Art West Midlands Engine is led by The New Art Gallery Walsall. It is funded by Arts Council England, and delivered with support from Walsall Council and our programme partners. © 2019 New Art West Midlands.